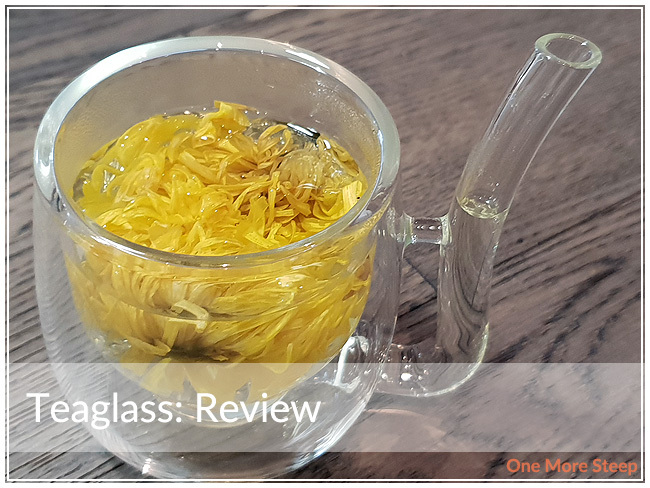 Teaglass has provided me with Teaglass for the purposes of providing an honest review. When I first saw the Teaglass on Instagram, one of the first things I thought to myself was “What is that?” in a really intrigued way. The Teaglass is designed for drinking yerba mate, a caffeinated plant that is steeped like tea is and traditionally made in a cup that’s fashioned out of a gourd with a metal straw, or bombilla. This Teaglass is thankfully not a gourd (I don’t think that would have made it through customs), and is made out of borosilicate glass that is hand-blown. 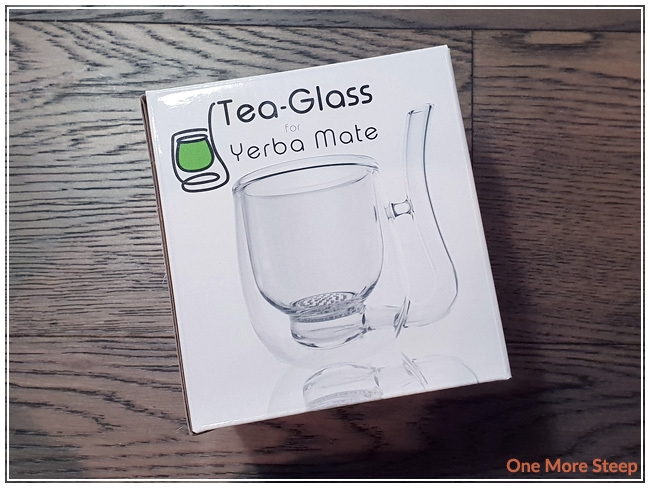 Teaglass boasts on their website that they are the first all-glass yerba mate cup that has a built-in straw and strainer – which I think is really neat. If you’re not familiar with borosilicate glass, it’s the same type of glass that was used in vintage Pyrex-ware and in vintage and modern day laboratory glassware. The Teaglass came in a sturdy cardboard box, and wrapped in some bubble wrap for safety during transport (and survival when in the hands of the postal service!). The first thing I thought when I opened the box was that it was just really cute. The Teaglass fits nicely into my hand (and I have small hands) and it seems quite solidly made. It features a double-wall for the cup portion of the Teaglass, and the straw curves away from the cup for when you’re drinking. The Teaglass logo decorates the bottom of the glass, it’s not intrusive by any means. I’m not a huge yerba mate drinker by any means, so I will actually be testing this neat cup out with some chrysanthemum tea. Teaglass states that their Teaglass is dishwasher and microwave safe. I washed it in some soapy warm water before using it. I think if you were really concerned, you could use a thin bottle brush for cleaning the straw portion. 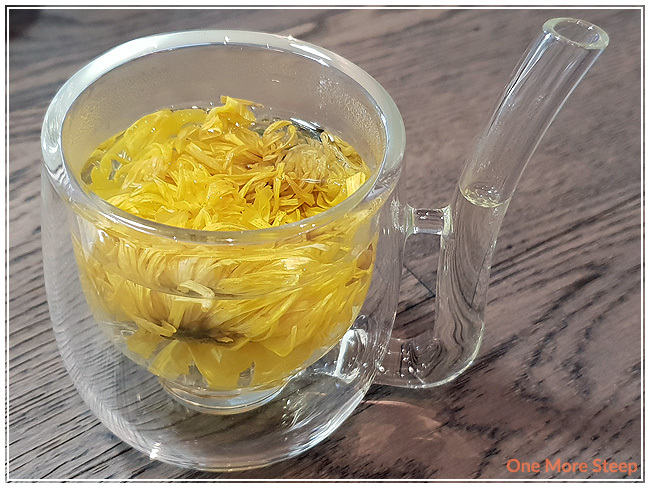 I dropped two huge dried chrysanthemum flowers into the Teaglass and then poured in my hot water to allow it to steep. 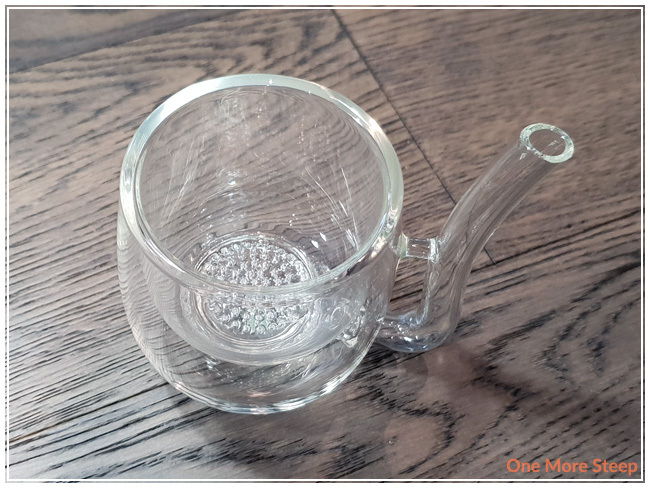 I do want to say that the holes aren’t like a fine mesh, so I wouldn’t try a very fine loose leaf tea in here as I think it might go through the holes or clog it (but you can always just rinse it out). After steeping, I drank the tea out of the straw. I think due to the size of the cup, tea does cool down fairly quickly. The double-walled feature of the cup means no burning your hands on a hot cup of tea, which is really nice. I think this would be great for steeping sessions of oolongs, blooming teas, pu’erh, or any straight teas that don’t have added oils to it. For instance, I don’t think that I would steep an Earl Grey in this, only because I think it’d be a pain to clean any residue of the bergamot oil. There were only smooth edges to the Teaglass, for anyone concerned about that. The size is a comfortable hold for me, and it was a fun experience. I’m definitely going to try some dragon pearls in it next, I think. Just the nature of being able to do some short, small steeps in this cup makes it quite ideal for more delicate teas. And the fact that your tea sits with the leaves, it makes it nice for grandpa-style tea steeping. I loved Teaglass’s Teaglass. I just found this to be a very clever cup. It was easy to use, easy to clean, and made drinking tea quite fun. I found myself just resteeping over and over again because it was just fun to use. 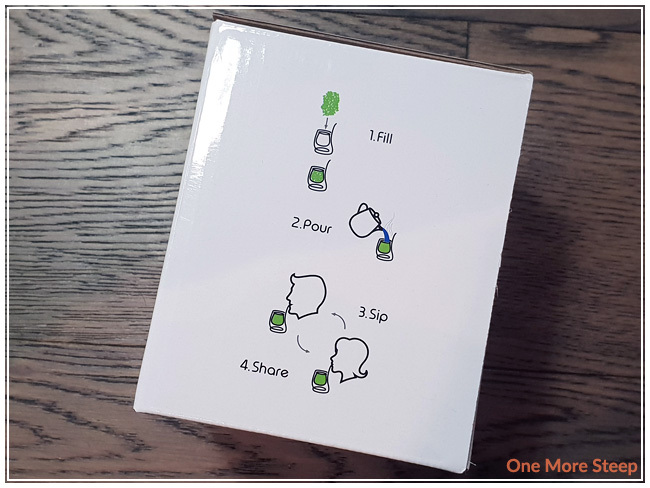 The small size makes it easy to do multiple steeps of the same tea, since you don’t have to go through a whole teapot, and the double-walled feature in the cup saves your hands from getting too hot. The fact that it’s hand-blown just kind of puts it over-the-top in the ‘cool’ category, because I just really appreciate the craftsmanship that went into it, it’s so detailed and if you head over to Teaglass’s Instagram page, you’ll also see how uniform the cups are between each other (which is doubly amazing).